Cars are warm and cozy places that make perfect hiding places for rats. But the rats can be highly destructive and chew threw critical wiring. 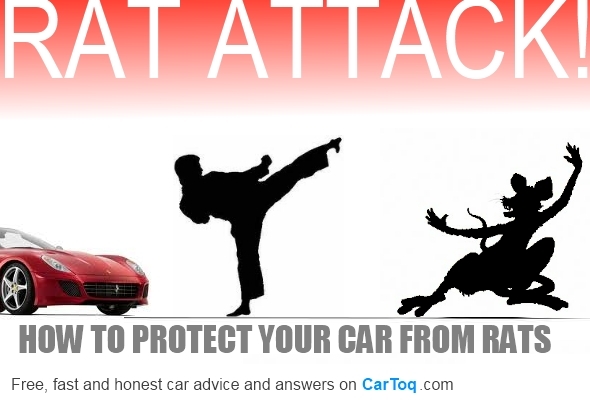 Here’s how you can protect your car from rats. I hate pests. I’m an avid animal lover but I cannot look lovingly at a cockroach in my kitchen or a lizard on the wall and say “Hey, you know, these things have been there since the time of dinosaurs”. Sorry, not my type. Similarly, while I love watching Tom and Jerry on TV, a mouse or a rat, ticks me off, and if that godforsaken thing is within 10 feet of my car, I know it will try its best to cause damage. So here’s why rats love cars, and some advice on how you can get rid of them. Why do rats love cars? They don’t. Rats love any dark, musty, smelly places with a lot of crevices and nooks, to hide themselves, and their food. Car engine bays, underbodies and wheel arches are full of such nooks and crannies, which attract rats. Rats enter car cabins in search of food. So always ensure that your car cabin doesn’t have anything edible in it. Also most cars in our country are parked near footpaths or in basement parkings that are close to drains. Drains harbor entire rat colonies and in the rains, or when it’s breeding time rats prefer warm cozy spots like the engine bay of a car to a damp drain. Now that we know rats are not car buffs, here’s how they get into your car. How do rats enter the engine bay and cabin? One point of access is from the wheel well along the axles and into the engine bay. Favorite hiding spots for rats in the engine bay are behind the battery, under the engine cover, between the headlamps and the radiator, between the firewall and the engine block etc. Getting into the cabin is actually a matter of luck, even for the rat. Most cabins are well-insulated, but there are spots like the fresh-air vent of the AC or the rubber grommets on floor-mounted pedals that can let rats in. Sometimes a rat will simply walk in when you’re not looking and have your door open. The biggest temptation for a rat to enter the cabin is smell of food, so ensure you don’t leave any food items for too long in the car. What damage can rats do? Rats can do a lot of damage. Once inside a car, they forage, and with that foraging they not only urinate and defecate, but generally add to the foul smell in the car. Some rats, once inside, can’t get out, as the AC fresh air vent from which it entered may have closed. And God forbid, if a rat dies inside your AC system – the car will smell worse than a World War II gas chamber. But that’s a lesser evil compared to what they can do. Rats love chewing things – and cars with plenty of wires offer a lot to chew on. In the engine bay, they bite hoses, belts, wires, bulb holders, rubber inserts, felt linings, fasteners and the like. Some of these parts can’t be replaced individually and would involve changing a whole unit. Cut wiring can result in blown fuses and short circuits. And the damage can be very expensive. For example, the ECU in the Scorpio costs Rs. 80,000. The entire wiring harness costs Rs. 17,000. Worse still the damage can manifest itself when you are in a remote area and leave you stranded. The best remedy is, what someone great said: A stitch in time saves nine. Observe your car’s engine closely, at least once a week by opening the bonnet, either in broad daylight or under a strong inspection light. Pay specific attention to corners, stains left by rat urine, rat droppings, small plastic pieces, rat foot prints on the engine cover etc. Then thoroughly wash the engine bay. Tie any loose wires with fasteners, insulation tape and even a thread if required to ensure that there is nothing amiss or loose so the next time you open your hood, you know what it was like, the last time. Get some wire mesh to seal off fresh-air vents to the cabin, if your car does not have it. It will not cost you more than Rs. 500, but your cabin will be safe, 90% of the time. If you park in a garage or in the basement of your apartment, make sure any nearby drains and the floor under the car is sprayed with industrial phenyl. This will prevent rats to a great extent. Always clear all foodstuff from your car. This will ensure rats are not attracted to the car. Get your interiors cleaned thoroughly, regularly. Following the above will ensure that your car is, at least, not the preferred choice for rats. But if you already have been attacked by rats, here’s what to do. Inspect your engine bay THOROUGHLY, Every day for the next 2 months after doing the below prescribed remedial measures. Rats leave their marks, like most animals, by urinating at many places, specifically those which are difficult to clean. Scrub every hose, every wire, every inch of your engine bay squeaky clean. Else, their urine, which is neutral to human nose, will keep on attracting them, in bigger and bigger numbers. If there was rat that died in your cabin, get your car cleaned by a professional using the best possible products. Rats carry disease. Spray your engine bay with phenyl, every 3 days, for the first 2 weeks and then every week for the next 2 months. If the phenyl smell is not pungent enough, get the worst quality of chewing tobacco and sprinkle it in the engine compartment, once every 3 days, for 2 months. If possible, park your car with its hood open, to allow maximum light and air to pass through. Change your parking spot, at least for a week and completely disinfect your parking spot.